Mao Zedong was a Chinese statesman whose status as a revolutionary in world history is probably next only to that of Vladimir Lenin (1870–1924). More than anyone else in recent history, Mao Zedong helped to reshape the social and political structures of his ancient and heavily populated country. 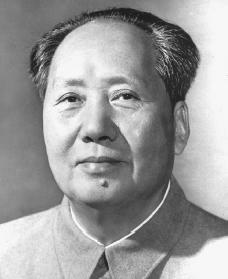 Mao Zedong was born in Shaoshan, Hunan, China, on December 26, 1893. Mao had two younger brothers and one younger sister. His father, Mao Jensheng, had started out as a poor peasant but eventually paid off his debts, became a landowner, and started a business trading rice. A devoted follower of the religion of Buddhism, his mother, Wen Ch'i-mei, wanted her son to have a religious career. Mao did not venture outside his home province (state) until he was twenty-five. Up to then, his formal education was limited to six years at a junior normal school where he acquired a limited knowledge of science, learned almost no foreign language, but developed a clear written style and a considerable understanding of social problems, Chinese history, and current affairs. However, Mao inherited the practical traditions of Hunan education with the hope that somehow it would help him find ways to strengthen and improve his country. Chinese Communist Party (CCP) in 1921, of which Mao was one of fifty founding members, these activities were pursued with added energy and to a greater depth. Meanwhile, the major political party, the Kuomintang (KMT), was reorganized, and a coalition (partnership) was formed between the KMT and CCP. Mao's main task was to coordinate the policies of both parties; however, he was unable to prove himself in this position due to his lack of academic and social standing. In 1925 when the coalition ran into problems, Mao was sent back to Hunan to "convalesce," or recover. An unfortunate result of this setback was that Mao was completely left out of the nationwide protests against Japan and Britain in the summer of that year, during which many of his comrades made their mark as leaders of the trade union movement or party politics. Out of his "convalescence," Mao discovered the revolutionary potential of the peasants, the poor farm workers whose great numbers had been treated poorly by the warlords. From then on Mao switched his attention to this vast underprivileged class of people. Mao's newly acquired knowledge and experience enabled him to play a leading role in the peasant movement led by both the KMT and CCP. By 1927 he was in a position to support a class substitution in the Chinese revolution. Mao proposed that the poor peasants fill the role of revolutionary vanguard (the most important positions). Shortly after the publication of his Report on the Peasant Movement in Hunan, the KMT-CCP coalition broke up and the Communists were forced underground. Some survivors of the party went underground in the cities, to continue their struggle as a working-class party; the rest took up arms against the government and eventually established rural soviets (small governments) in central and northern China. One of these soviets was Mao's Ching-kang mountain base area between Kiangsi and Hunan, where he had to rely chiefly on the support of the poor peasants. The soviets threatened to disrupt the unity of the revolutionary movement, because it was thought that it would break it up into small pockets. The center of the CCP, located underground in Shanghai, China, therefore took on the task of strengthening its leadership and party loyalty. A successful revolution, in its view, had to take the course of a series of urban uprisings under proletarian (working-class) leadership. In its effort to achieve this, the center had to ease the growing powers of the soviet leaders like Mao. Its effort gradually produced results: Mao first lost his control over the army he had organized and trained, then his position in the soviet party, and finally even much of his power in the soviet government. The years of this struggle within the party coincided with Chiang Kai-shek's (1897–1975) successes in his anti-Communist campaigns. Eventually Chiang was able to drive the Communists out of their base areas on the Long March (a year-long, six-thousand-mile journey through the hills of Shensi). The loss of nearly all the soviets in central China suffered by the Communists proved the weaknesses of central party leadership. When the revolutionary movement slowed and the hardships of the Long March were felt, those who might have challenged Mao for leadership fell by the wayside. By the time the Communists arrived at Yenan, China, the party had gained a measure of unity, to be further consolidated (brought together) after the outbreak of the Sino-Japanese War in 1937, where China and Japan fought over land in China. This was the first truly nationalist war China had ever fought, in which the nation as a whole united to face the common foe of Japan. By early 1941 the unity between the KMT and CCP had come to exist in name only. This new situation called for the emergence of a Communist leader who could rival Chiang in case a civil war broke out. Mao was such the person, and soon his popularity began to grow. The personality cult (a community of worship) of Mao grew until his concepts were written into the party's constitution of 1945 (the constitution would outline the party's rules and principles). Under Mao's brilliant leadership the party fought from one victory to another, until it took power in 1949. Mao's concepts now guided the Communists in their way of thinking, their organization, and their action. In giving their faith to Mao's belief, they found unity and strength, and an understanding of the nature, strategy, and tactics of the revolution. But Mao's concept had very little to say about the modernization and industrialization of China. Therefore, after 1949 the CCP was left to follow the example of the Soviet Union, with Soviet aid in the years of the cold war, the four-decade period of sour relations between Communist and free-world powers. Mao launched the Socialist Upsurge in the Countryside of 1955 and the Great Leap Forward in 1958. The essential feature of these movements was a reliance upon the voluntary spirit of the people motivated by a new moral discipline, rather than upon money. The failure of the Great Leap Forward hurt Mao's power and reputation even further. At this time, the worsening relations with the Soviet Union made its fatal impact. Withdrawal of Soviet material aid practically all but ended China's attempt to copy the Soviet model. In the midst of this, Mao began his comeback. During the famous Cultural Revolution of 1966 through 1969, Mao organized the army and young students into the Red Guards. With their help, Mao began to reorganize the CCP. Soon there was no Chinese thought beyond the extent of Mao's thought. By this Mao hoped to create enthusiasm of the Chinese masses to work harder while enduring a quiet and uncomplicated life. This may be the only way for a poor and heavily populated country like China to afford rapid transition into an industrialized country. By the time Mao was in his late seventies, his life's work was essentially done, although he retained power until the end. Physically weakened, suffering from a lifetime of effort and Parkinson's Disease (a brain disorder), Mao's ability to rule in new and innovative ways to meet the demands of China's modernization grew increasingly weak. One of his final major acts was to reopen contact with the United States. On September 9, 1976, Mao died in Beijing, China. Mao was undoubtedly the key figure in China in the twentieth century and one of the century's most important movers and reformers. He had devoted his life to the advancement of a peasant class terrorized for centuries by those in power. However, in pursuit of his own goals, Mao himself could be a violent and overpowering ruler. Feigon, Lee. Mao: A Reinterpretation. Chicago: Ivan R. Dee, 2002. Garza, Hedda. Mao Zedong. New York: Chelsea House, 1988. Terrill, Ross. Mao: A Biography. New York: Harper & Row, 1980. Reprint, Stanford, CA: Stanford University Press, 1999. Japan fought over land in China. This was the first truly nationalist war China had ever fought, in which the nation as a whole united to face the common foe of Japan.